Fungal infections of the nails are widespread and easy to contract. They are more likely to affect adults than children, and affect toenails rather than fingernails. They can also look unpleasant and more serious than they really are. However, there is nothing to be worried about as there are cures. Can I buy an antifungal treatment online? The Online Clinic can prescribe terbinafine to treat fungal nail infections. Just complete a short consultation form and we will prescribe a treatment for next day delivery. 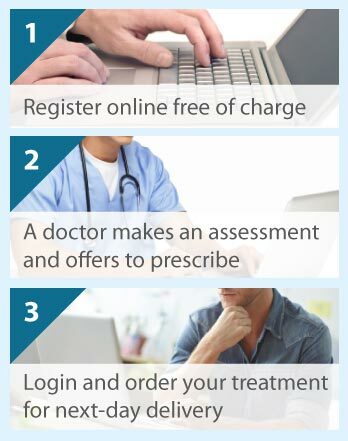 Our price includes the private prescription and next day delivery. The consultation is completely free of charge. A fungal-infected nail generally becomes thickened and turns a different colour, usually white or yellowy-green. The discolouration generally indicates where the nail has separated from the nail bed, that being the skin beneath it. Infected nails may also become soft and crumbly, and pieces may flake off. With very bad infections of long duration, the nail can eventually be destroyed or drop off. Other symptoms of fungal nail infections include red, sore skin surrounding the nail. Early on, fungal nail infections are not usually uncomfortable but, over time, they can become painful. This can lead to problems in walking (in the case of toe nails) and using your fingers (in the case of hand nails). What are the causes of a fungal nail infection? Fungal nail infections come about when spores (seeds) from fungi grow in your nails. Fungal nail infections are usually caused by a fungal skin infection spreading to the nails. Such a case would be when the fungal skin infection called athlete's foot infects the toenails or the fingernails if you touch your infected toes. Another is when the yeast known as candida infects the skin and lead to fingernail infections. However, there may be no obvious reason why your nails have become infected. Some circumstances increase the likelihood of getting a fungal nail infection. The chances of getting a fungal nail infection increase when your nails are damaged or weakened. Biting your nails and washing your hands a lot can do this. Similarly, your nails are at risk when you are in a hot and humid atmosphere, and your feet and hands are hot and sweaty. Your general health will also affect your chances of infection, particularly if it is in a poor state. People with specific health disorders are also more vulnerable, such as people with diabetes or psoriasis (also a skin condition), or an immune system that is weakened (by medicines or illness) and not protecting their body from infection as well as it should do. Like many other conditions, the likelihood of getting a fungal nail infection is increased if you smoke. Can fungal nail infections be treated? To stop fungal nail infections from spreading, it is recommended that you seek treatment as soon as possible. However, treatment may not be necessary if the infection is mild and not a problem. Simple hygiene practice may ward off the infection. You should have treatment if symptoms are more severe or bothersome. In this case, a piece of your nail may be tested in a laboratory to confirm it is a fungal infection. Fungal nail infections can be treated with antifungal tablets or antifungal nails varnish. Once cured, your nails can look normal again but some may never look exactly as they were before the infection. The important thing is to get treatment. You can obtain treatments for fungal nail infections from The Online Clinic by completing the short online questionnaire. Click on the free consultation button below to commence.